Just as the length of your foot varies in size from person to person, the width does too. Any person with wide feet knows the struggle of finding comfortable shoes. Not just a problem with regular shoes but also with snowboard boots, renting bowling shoes, even snorkeling fins can be hard to find. While you may have to work a bit harder, it is still easy to find snorkel fins for wide feet. That is, as long as you know what you are doing. To help, we have created a guide to take all the guesswork out of making your decision. Let’s take a look. 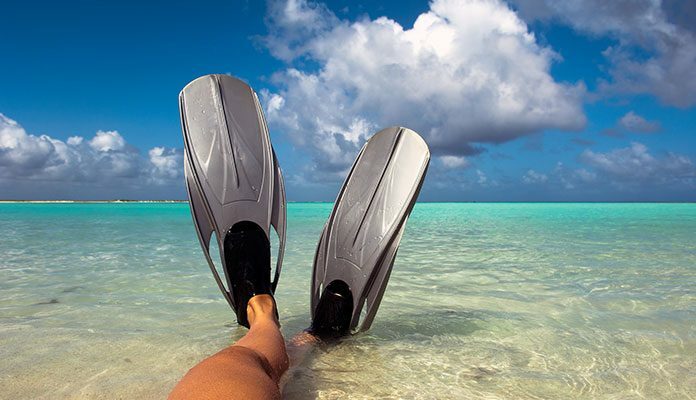 Women with wider than average feet have many options when it comes to snorkel fins. Most companies that make fins only have male sizes and will have sizing charts with the female equivalent. This means that 99% of women will fit into the fins without a wide version. It is recommended to increase your size by one if you find that you have wide feet. This will ensure that your feet have enough room without causing blisters or discomfort. When looking for wide snorkel fins for men, you first need to identify the width of your foot. This can be done by looking at your shoes you wear most often and reading over the size. Men’s shoes are made with the normal size being D. Shoes designed for narrow feet are sized with the letter C. For wider feet you will see a variation of the letter E. Depending on your width you will go a bit wider displayed as EE, a bit wider than that EEE and so on. The length of your fin will be determined by what you’re using it for. Scuba divers will favor a more robust and longer fin. This adds weight and decreases your agility in the water. These fins will also give you the ability to wear water boots which make it easy to enter and exit the water. If you are more of a free diver you will want a longer, lighter pair of fins. This will give you the agility and power you need without exerting too much energy. With today’s technology, there are three different styles on the market to perfectly fit your wide foot. The National Geographic Fit Fins: these fins are designed to comfortably fit a wider 12 EE sizing foot. The open heel strap design is adjustable to fit a varying size of feet. The comfortable fit doesn’t compromise with features offering everything avid snorkelers look for. The Tilos Getaway: This open heel adjustable fin offers sizes measuring up to a 13 EEE. With a long fin measuring at 20 inches for the largest size the blade is quite stiff but an excellent option for wide feet. The Oceanic V6: While this fin doesn’t say that it measures specifically for wide feet, it has quite a generous foot pocket suiting a wide foot. With the largest fitting a men’s size 12 this is a great option for those looking for a split fin style. No longer do you have to squeeze your foot into a fin that doesn’t properly fit you. Committed to helping find the best pair of fins for wide feet on the market, we are certain that any of the three brands on our list will get you comfortable and happy snorkeling in the water. Now that you have the right gear, all that is left to do is book your next snorkel trip. Have you tried the wide foot snorkel fins on our list? Let us know how you found their fit in the comment section below.